“Six Thanksgivings” is an episode that delivers exactly what it says on the tin—glimpses into six very different Pearson-related Thanksgivings. The episode was actually originally going to be titled “18,615” after the number of people 17-year-old Randall estimates he’s met in his life (apparently some people are far less introverted than I am! ), but the rename is an effective switch that better captures the episode’s enjoyable simplicity. Like last week’s episode, “Six Thanksgivings” is a quiet, impressionistic outing with a lot of emotional maturity; it offers slice-of-life storytelling while resisting the urge to tie everything together into a neat bow. 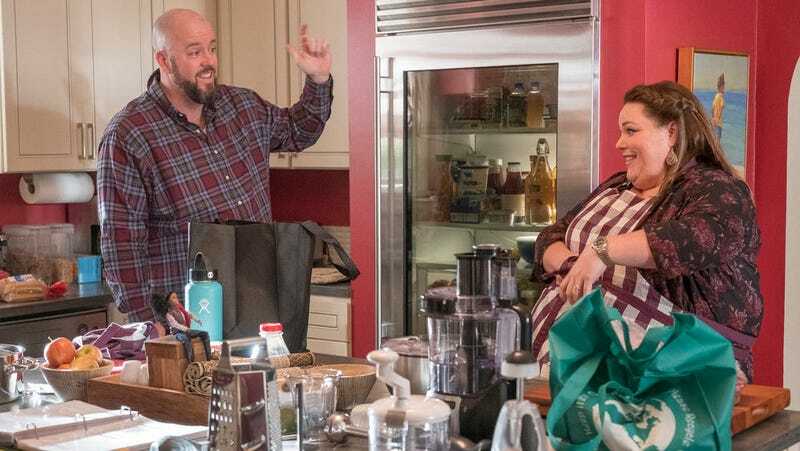 It’s also a warm, sweet episode that makes the case that the reason to hang out with the Pearsons each week isn’t just because of their tearjerking melodrama, it’s also because it can be really fun to spend time with them. That’s just one of this episode’s six Thanksgivings, the others of which include Randall, Beth, Deja, and Annie serving dinner at a Philly soup kitchen; Kate and Toby taking over cooking duties at Randall’s house while looking after Tess; Jack and Nicky’s uneasy Thanksgiving in Vietnam; the early days of William and Jessie’s courtship; and present-day Rebecca and Miguel’s tense Thanksgiving with his side of the family. Rather than constantly cutting between the six storylines, they mostly unfold one after the other, the better to let their subtle emotional arcs play out. This episode is chockful of wonderfully observed, nuanced relationship dynamics—from the believable tension developing between Randall and Beth to Kate and Tess’ lovely dynamic as they bond over first periods and first crushes. There’s an elegant, effortless quality to this script by first time This Is Us writer but long-time TV creative force Kevin Falls. (Among many other things, Falls has some standout West Wing episodes to his name, including the iconic Butterball Hotline Thanksgiving episode.) Deja only speaks a line or two in this episode, yet she gets a whole emotional arc about quietly processing her new life as a Pearson while starting to make peace with her relationship with her mom. There’s stuff to love in each of tonight’s six storylines, but the three that are going to stick with me the most are the ones that subtly, unexpectedly expand This Is Us’ world. To start with, Jessie is back! Ever since the first season made a big deal of introducing him as William’s boyfriend and then mostly seemed to forget about him, Jessie has been one of This Is Us’ most awkwardly dangling threads. I don’t know if Denis O’Hare’s schedule prevented This Is Us from doing more with Jessie than the show originally wanted to, but it’s so nice to finally have him back. While some of the previous attempts to weave Ron Cephas Jones into the series following William’s death have felt awkwardly shoehorned in, this one fits more naturally into the fabric of the show because it answers lingering questions we have about William’s life. It’s also just a lovely little rom-com between two world-weary but openhearted people. Jessie’s flirty, “Relax, William, she’s my cousin,” is the perfect understated emotional climax for their meet-cute storyline, which I hope is the first of many more Jessie/William stories to come! Beyond Jessie’s unexpected return, the element of “Six Thanksgiving” that full-on blew my mind was the examination of Miguel’s family, which, frankly, is something I’d literally never even thought about before. The moment Rebecca mentioned something about “our grandson” in relation to a kid on Miguel’s side of the family was a shock to the system and a reminder that, of course, Miguel and Rebecca have a whole life outside of Rebecca’s kids. It turns out that not only is Miguel on bad terms with his own adult children, Rebecca is the “Miguel” of the Rivas family—the person who’s seen as an awkward interloper with a suspect connection to their dad. How the tables have turned! The Rivas Thanksgiving storyline is the most classic This Is Us element of the episode, in that it features a big speech in which Miguel hashes out his family issues and staunchly defends Rebecca. But, like most elements of “Six Thanksgivings,” it’s also content to leave things largely unresolved. There’s plenty of blame to go around when it comes to Miguel’s imperfect relationship with his kids—much of it on him. But to some extent, it is what it is. The sadness (and hope) of Miguel’s imperfect family relationship exists alongside the warmer dynamic he now has with the Pearsons. In previous episodes, I wouldn’t have thought much about watching Annie warmly hug her grandpa. Here it comes as a huge moment of emotional catharsis. In waiting so long to introduce the Rivas side of the equation and how that factors into Rebecca and Miguel’s relationship, This Is Us offers a pointed reminder that we seldom know the extent of what our friends and relatives are dealing with in the fullness of their own lives. A slice of their life doesn’t represent the full picture. That also turns out to be the case with Jack’s necklace, too, the mystery of which is resolved in the most unexpectedly low-key way imaginable. It’s possible there’s still more to Jack’s relationship with the Mystery Village Woman (who I think is still unnamed), but this also feels like a conclusion in its own right. The necklace wasn’t a symbol of their love for one another and their photo together was more of a random snapshot than the capturing of a crucial relationship. Jack’s decision to help her injured son is a relatively small choice for him—the equivalent of the fireman bringing baby Randall to the hospital—but it’s a massive one for her, and the necklace is a symbol of the way the people who impact your life the most don’t have to be people you even know all that well. The major theme emerging in This Is Us’ continually compelling Vietnam War storyline is the way the mechanics of war (and this war in particular) erode trust. Last week, Jack agonized over whether his temporary ally was Viet Cong, only to learn the truth is seldom black and white. Nicky, meanwhile, is still scarred by the death of his kindhearted commanding officer Bones, who was betrayed by the local villagers he had seemingly befriended. To have trust in this harsh environment—whether it’s trust in your field medic to save your life or trust in a foreign solider to help your injured son—is a truly radical act. It’s one Jack is still capable of, while Nicky, perhaps, isn’t. There are still big mysteries left to be unraveled this season, not only the flash-forward “her” mystery (which hasn’t been referenced in a while), but also how Nicky died. Yet while it might ultimately relate to those mysteries, “Six Thanksgivings” isn’t about them. In these past two episodes, This Is Us has locked into a tone that works so well for the show—low-key storylines that distill the complexities of life into small, nuanced portraits. After a so-so start to the show’s third season, these impressive back-to-back episodes are the best Thanksgiving treat I could ask for. Man, jumping from Jack and Rebecca’s first days together in “Sometimes” to their last weeks together in “Six Thanksgiving” really, really got to me. This episode is elegantly directed by Thirteen/Twilight director Catherine Hardwicke, whose career serves as one of the prime examples of how Hollywood screws over female directors. I hope this marks the start of a big comeback for her! I’ve been trying to avoid objectifying male celebrities lately, since it bothers me when people do it to female celebrities. But, umm, yes, that extended half-naked Randall scene does exist. Tess’ sweet, tentative coming out storyline is a perfectly timed holiday reminder to keep your language inclusive when you’re asking your extended relatives about their dating lives! That goes double when talking to kids and teens who might still be on the verge of figuring out their sexual orientations and looking towards the adults in their lives to see what’s considered normal and acceptable. Thanks This Is Us, and happy Thanksgiving everybody!